Small, unpaid fines can mess up your credit score, even your life. I have to wonder where civilization is headed when I hear stories about people such as Harriet Cleveland. She’s a working grandmother from the American south who wound up in prison for – better brace yourself for this – failing to pay fines relating to a few low-level traffic tickets. 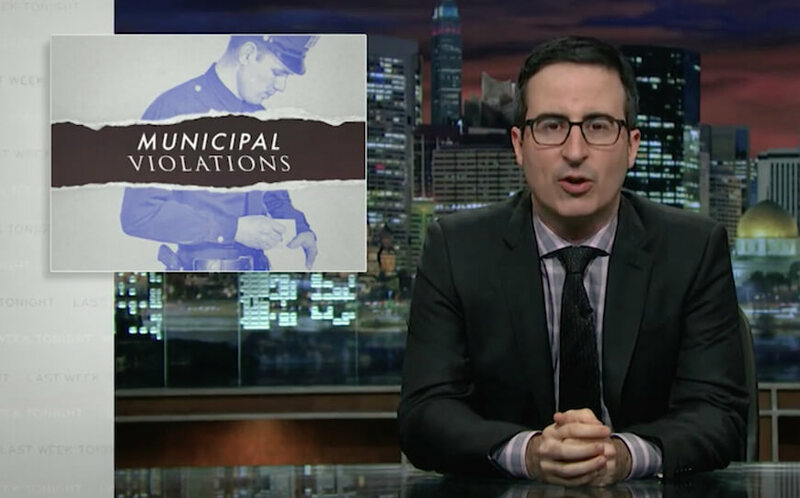 So reports HBO TV’s John Oliver in his show, Last Week Tonight. As Oliver notes with outrage, the woman essentially ended up in debtors’ prison, something that was supposed to have been outlawed in the United States in the 1830s. We learn that Harriet had let the traffic ticket fines lapse … Suddenly one day she was visited at her home by a police officer who escorted her to jail. We learn that Harriet – a low wager earner who barely gets by living paycheque to paycheque – had let the fines lapse and was unaware of judgements against her from behind the scenes. The penalties had grown over time to thousands of dollars due to government surcharges as well as to hefty fees applied at compound interest by a collection agency. Suddenly one day Harriet was visited at her home by a police officer who escorted her to jail. Ten days later she was released thanks only to the efforts of a social justice agency called the Southern Poverty Law Centre. See the link here. Here in Canada, we ought to be thankful that – so far as I know – people are not yet being rounded up and jailed for infractions of this nature. Still, in our land there can be a big downside to following in Harriet’s footsteps. The failure to pay small fines and penalties in Canada can badly influence a person’s ratings through credit bureaus, these being TransUnion and Equifax. The bureaus dutifully – and quite rightfully – keep score of how each one of us handles credit offerings and debt obligations over time. Our credit scores, through consent, are available for viewing by lots of folks including lenders and creditors, insurance companies, landlords, and potential employers. Does the local library actually give a hoot about that small penalty for returning Fifty Shades of Grey five weeks after its due date? Yes, it probably does. Under the circumstances, perhaps we ought to take stock of glib attitudes towards paying small fines and penalties. Let’s say you are among the wrongdoers. Doubtless you let the penalties ride – always with the danger of forgetting about them – because you think they are no big deal. Dismissive notions might enter your head in the form of rhetorical questions. Do municipal administrators honestly care about my little fine for not having a bicycle bell? Will the gym really come after me for being a few bucks short of covering my annual – mostly unused – membership? Does the local library actually give a hoot about that small penalty for returning Fifty Shades of Grey five weeks after its due date? Unfortunately in practice, all of those you’ve wronged likely will come after you. More and more these days – with budgets everywhere getting tighter – even mildly slighted folks are prone to seek their pound of flesh. By neglecting to divvy up for even minor fines, you can easily end up with a damaged credit score. With your name tarnished, you face the threat of hitting brick walls when you seek loans, any sort of credit, and the go-ahead for other things. Repairing your credit score can be difficult. At the same time, the bad rating can affect your ability to get on with matters that may be central to your well-being. With your name tarnished, you face the threat of hitting brick walls when you seek loans, any sort of credit, and the go-ahead for other things. You may find that you are unable to buy a car, get a mortgage, land a job, or even rent an apartment. Credit checks are routine these days. Who wants to green light a perceived deadbeat? My advice is, treat all fines and penalties, however small, as important matters requiring quick action. Or maybe look at it this way: If the trend in America is to re-establish debtors’ prisons for those who leave small fines unpaid, perhaps the harsh punishment will spread north to our land (heaven forbid). In any case, pay the library that late fee for Fifty Shades of Grey now.